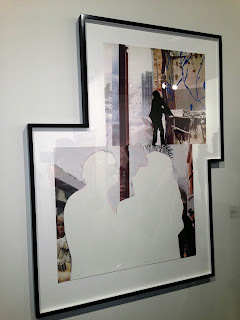 Earlier this month I had the privilege of attending several important shows in South Beach, FL: Art Basel, Design Miami and NADA, the New Art Dealers Alliance, Dec 5-8, 2013. The amazing art was a ‘given’ at the various venues; it was the high end of the high end of the fine contemporary art market. 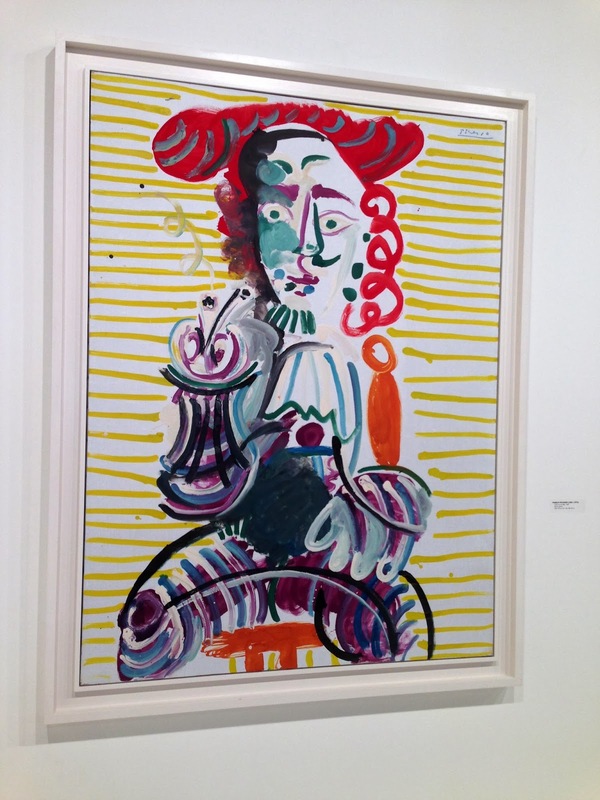 Pieces featured for sale ran the full gamut up and coming emerging artists to Picassos, Matisses and Rauschenbergs. The energy and excitement was contagious. The international crowd made for some fantastic people watching. I even had a few brushes with fame: Serena Williams & Martha Stewart! Art critics abound, I am not a critic; I do collect, I study, and I know what I like but again I do not claim to be a critic. My expertise is in framing, and art presentation, so my purpose here is simply to share what I observed through my ‘framer’s eye’ (and captured with an iphone) that may inspire new ideas for you to try out for your next project or body of work. Here are some observations, concepts and trends that stood out to me. Images follow below. 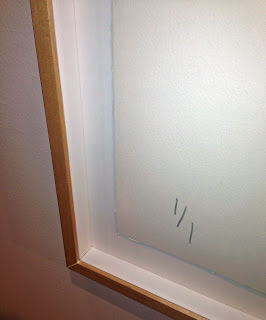 · Simple profiles in stark white and natural woods still rule in fine art framing. · Soft metallic finishes are important design elements to incorporate going into 2014. Champagne bronze, soft silvers and gold finishes in furnishings were on prominent display at Design Miami. 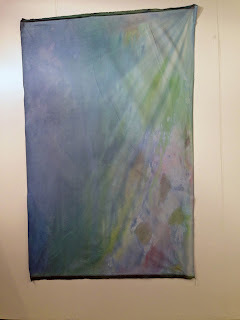 · Floating art, with or without mat boards gave all kinds of art, from etchings to watercolors, a high-end designer look. 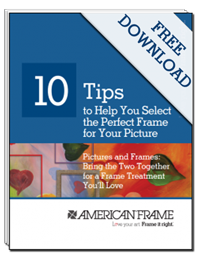 As we teach, it is important to keep the art away from the acrylic either with mat boards or spacers so air can circulate within the frame treatment. 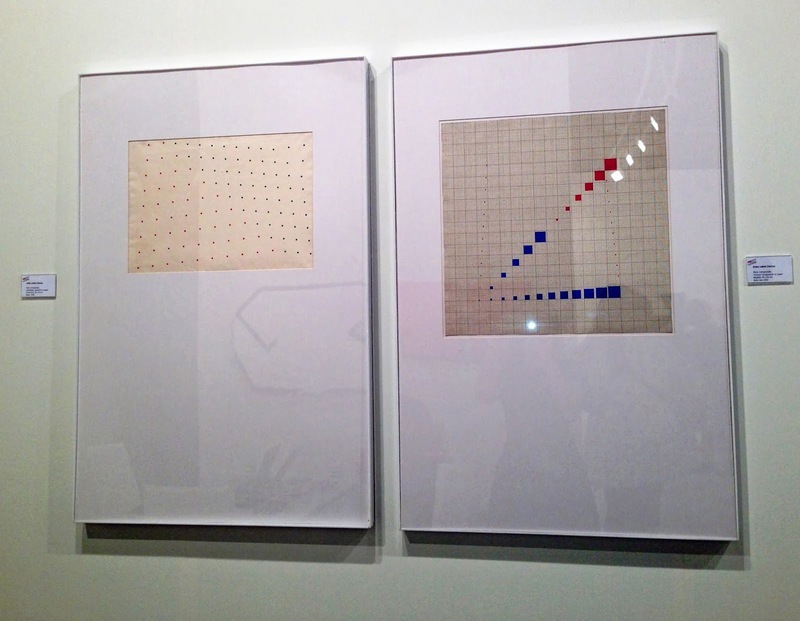 · Art groupings were prominent. I noticed quite a few displays of large, bright colored photography with strong white frames, framed to image, no mat, with spacers. 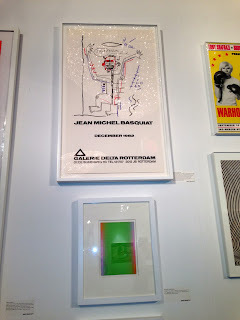 A hot look in contemporary framing. · Simple materials are made interesting with strong proportions in matting and framing. 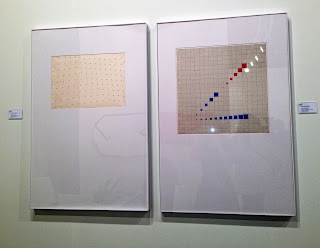 · Canvases were treated in various and unique ways: from simply being tacked to the wall like fabric without stretchers or frames, to being used as a room installation of sorts. Canvases were doubled up into a single image, both on stretchers and framed as a single piece, which was an interesting treatment I had never seen before. 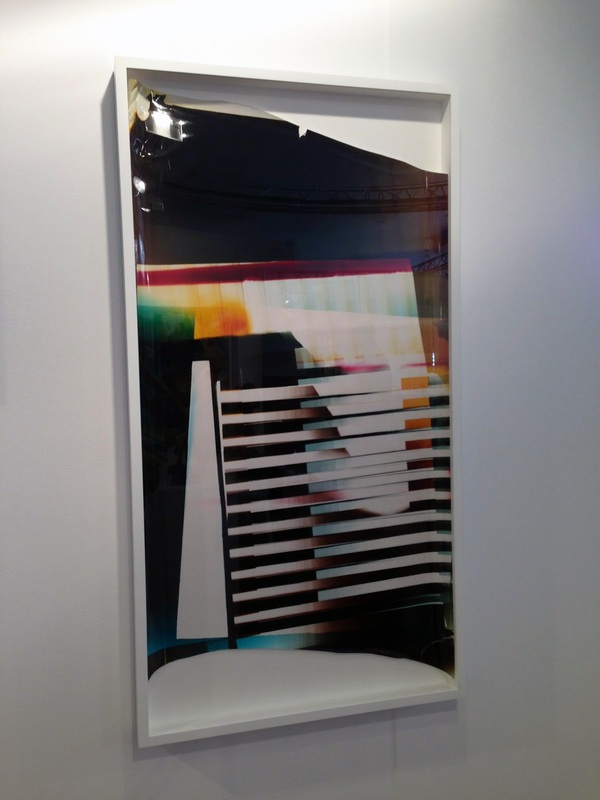 · Giclee prints seem to finally be an acceptable medium for image reproduction at the high end of the art market. It seems that serious collectors have finally accepted the medium. 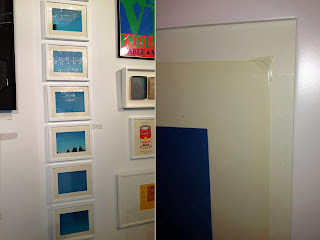 What I did notice is a variation in terminology used in defining the type of print; as if we are all confused on what really we should call it; Giclee, Archival Inkjet Prints, Pigment Prints, Digital Prints we’re all describing the same thing. There were several strong images presented on aluminum and on plexi-glass. 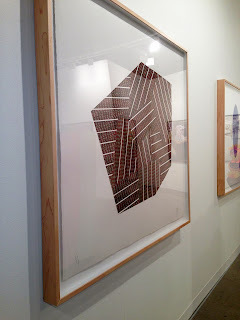 Like canvas, images printed on these substrates can stand alone without a frame, although I saw several pieces that were framed as if they were works on paper, complete with acrylic glazing which I’m assuming was for aesthetic purposes only. 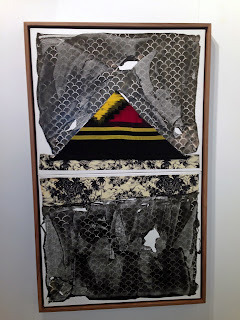 A montage of some of the materials showcased at Design Miami. From left to right: Gold chair, soft hammered silver home accessories, and chandelier in bronze, champagne silver, gold and crystal. 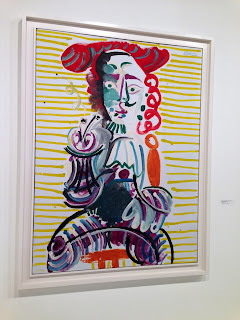 An original Picasso for sale. Of course, the price wasn’t listed and I was afraid to ask. Notice the white floater within another white floater frame. It looks like I need to find something like this to add to our line. 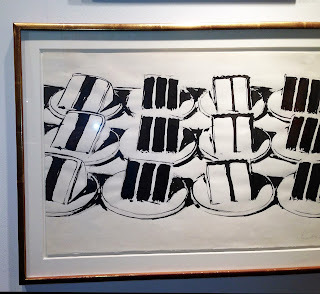 Take a look at this grid style picture grouping, ‘Ship Shape’ by Susan Miller. A series of 25, 4” x 6” photographs framed to image, no spacers, Nielsen #58 in Matte Black or equivalent, making many small photos into a high impact work of art. Ink gouache on paper, Lothar Charoux “Composicao’ shows the use of statement making mat board proportions to unify the art into identical sized framed pieces. 4 ply board matted to image in white metal. 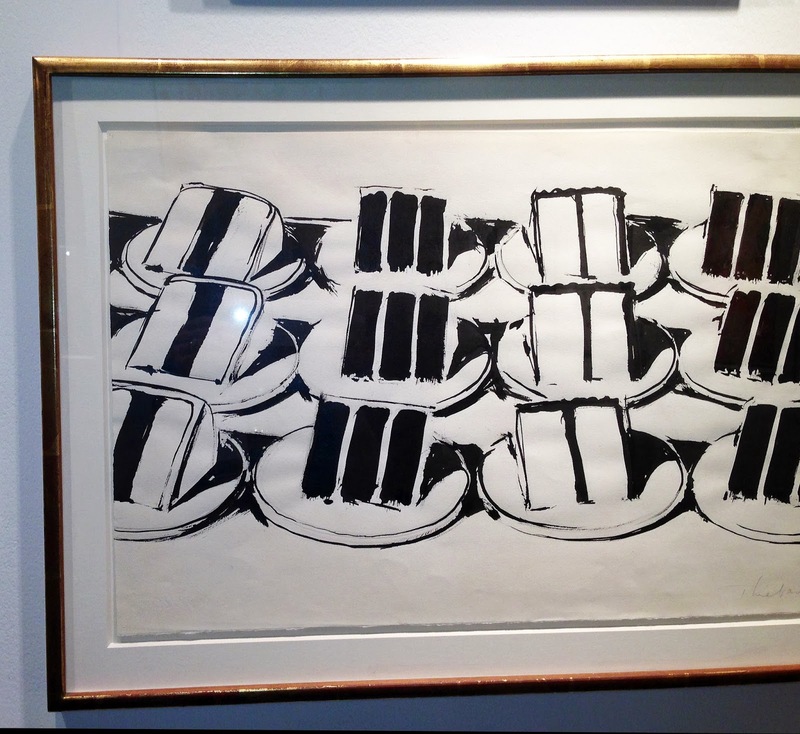 A Wayne Thiebaud original drawing, “Layer Cakes” framed in distressed gold, floated with a ¼” relief within a single 8 ply mat board. I find this to be an elegant look for a black and white piece. Artist John Baldessari framed his work “One and Three Persons” in what I can only describe as ‘unique’. I’m not particularly crazy about this treatment. It actually distracts from the art, but thought this idea should be shared for its original approach to the use of framing materials. 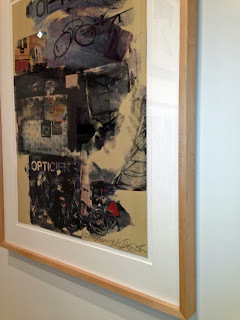 An original Rauschenberg print in the equivalent of our 51401 Infinity Natural solid maple frame. Who knows? Maybe it is our frame! Floated with a relief within an 8 ply archival mat board. In a similar framing application, notice the hand made spacer made from mat board strips and adhered within the frame for a deeper, more dramatic effect that what can be created with acrylic spacers. When you choose to do this, watch your corners! This would not have passed inspection in our plant. Ahh, my brush with fame. Martha and me. She did a talk at Design Miami on the democratization of design, a topic near and dear to me as I feel we have played a groundbreaking role in the democratization of fine art framing. It was a brilliant talk. I bought her book and had it signed as a gift for a close family member. 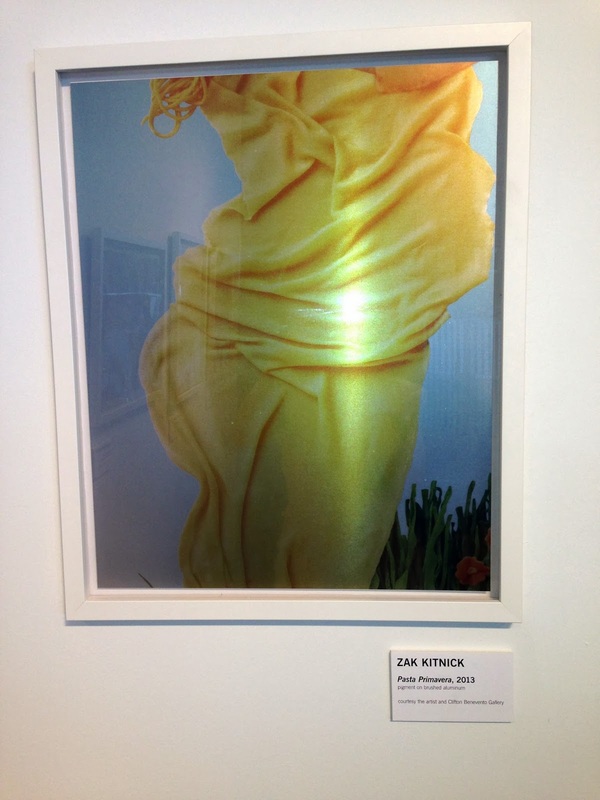 Artist Zack Kitnick “Pasta Primavera”. Pigment print on brushed aluminum. 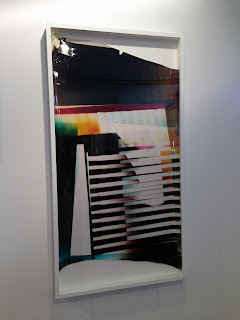 Artist Tobias Spichtig, Inkjet print on canvas. No stretchers. No frame. Just fabric. My apologies to the artist as I somehow lost the documentation on the name and title of this piece. 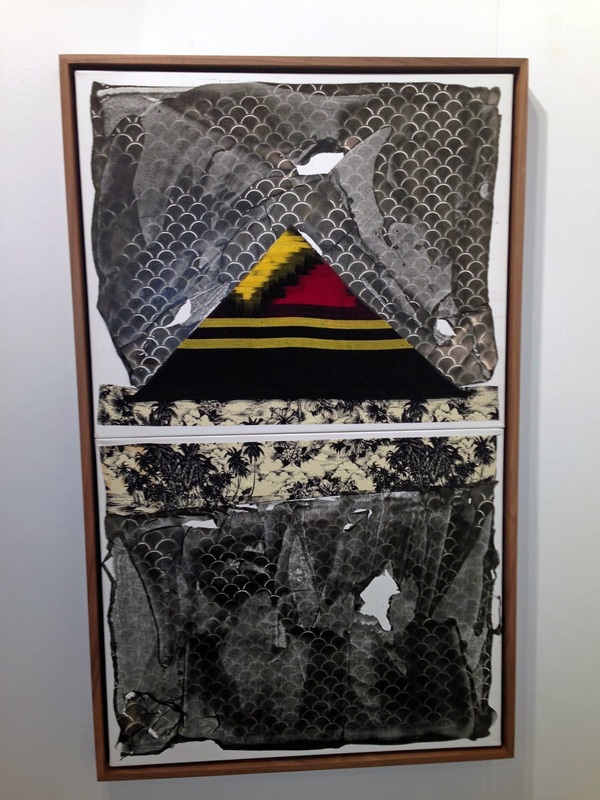 I find this work fascinating for its large proportion, strong composition, high gloss finish, torn and oversized, set into a clean white shadowboxed frame treatment. 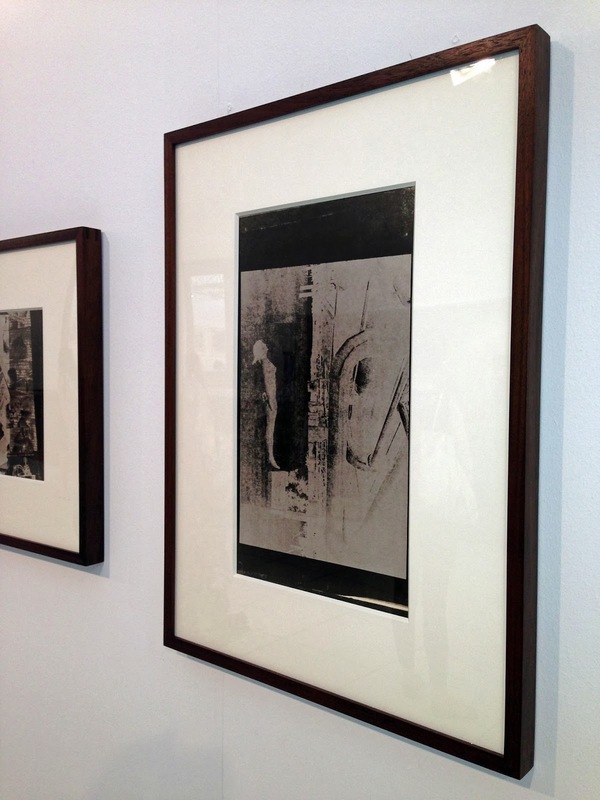 Artist Thomas Barrow framed these etchings in 4” classic cream 8 ply mat board with a dark walnut gallery style frame. A beautiful, luxurious look. Two canvases, one floater frame. Paintings by Lucas Knipscher. More contemporary white framing, this time for a Basquiat art poster. The surrounding pieces look light and bright in complementary treatments. This series is titled, “Throwing Three Balls in the Air to Get a Straight Line (Best of 36 Attempts),” 14 Photolithographic plates framed white wood and floated using traditional photo corners for an edgy effect. 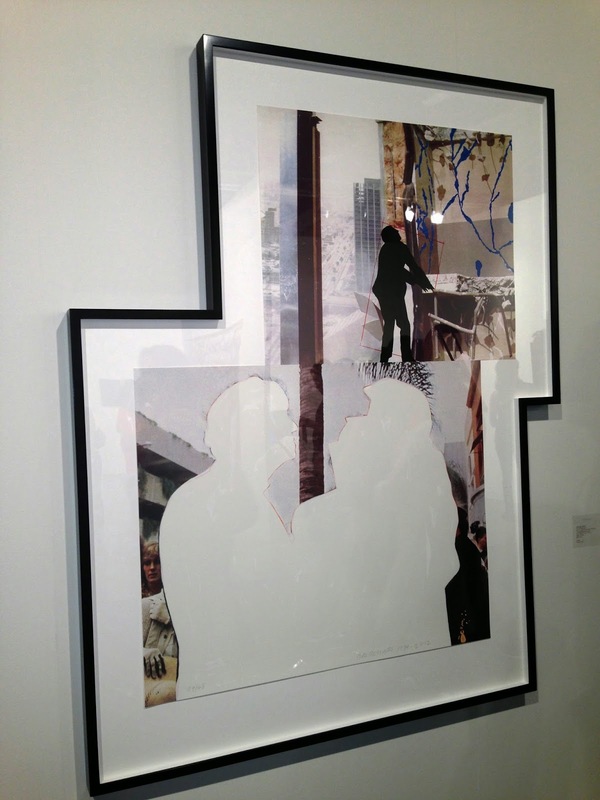 Another beautiful montage, this time, multi-media paintings are floated in a single, bright white panel. Artist Scott Treleaven. Pastel, crayon, pencil, house paint, gouache and collage on paper. I’m sharing this piece just because it’s lovely. Two canvas paintings on stretcher bars made into one panel by Japanese artist Miki Mochizuka. A room full of oversized canvases. Artist unknown. My iphone shot doesn’t do it justice but being in a space like that was energizing. Looks like it was fun for the artist to paint. 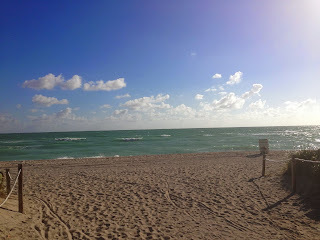 And of course, what is Miami without the beach? I got a few hours in during my stay. What about you? What do you think about some of these pieces? Have you been to any of these shows? What did you see that you’d like to share? I’d love to hear your thoughts. 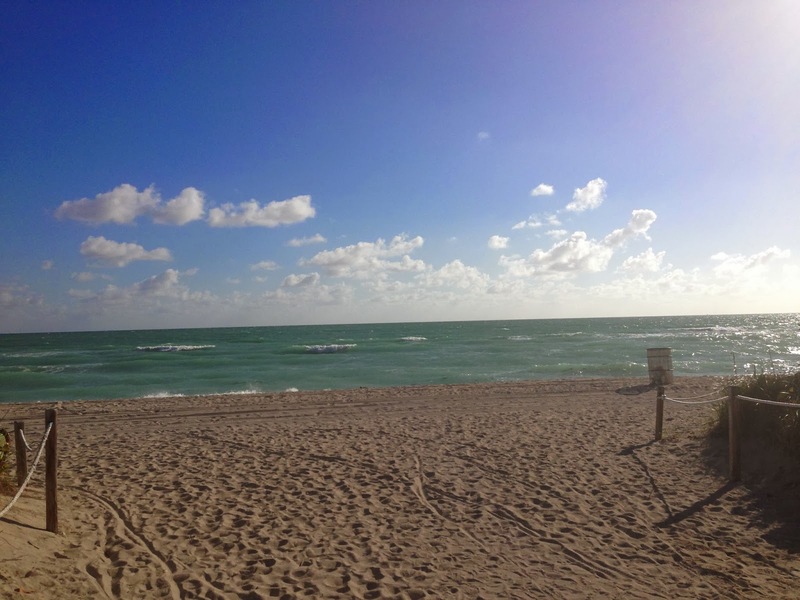 Miami beach still looks glorious.